AFCU visits Arkansas Children’s to show their support of the teen room renovations. 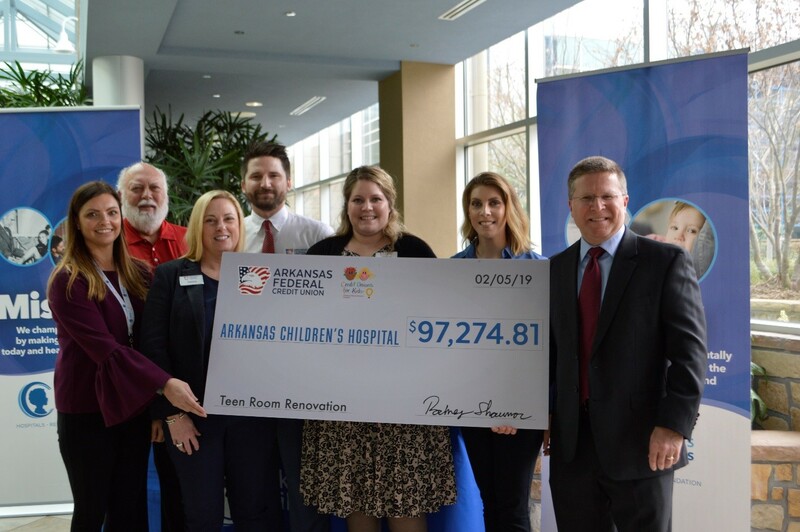 Arkansas Federal Credit Union raised over $97,000 in 2018. Arkansas Federal has been a generous partner to Arkansas Children’s through the Children’s Miracle Network Hospitals partnership for over 20 years. They have contributed nearly $218,000 towards their $300,000 commitment to renovate the teen room at Arkansas Children’s Hospital. The funds raised since 2017 are being used to update the teen room located on the third floor. This space is designed specifically for teenage inpatients. The teen room is stocked with DVDs, books, games and electronics. We are grateful for Arkansas Federal’s unyielding commitment to our patients and families. Thanks to the generous support from community donors like Arkansas Federal, the child life and education department will continue to have the resources we need to provide a safe and kid-savvy environment for our patients.